Intestinal Tone Psyllium Husk fiber supplement is an excellent source of fiber from the highest grade of finely ground psyllium PLUS organic prebiotic fiber to help the good bacteria in the intestinal microbiome PLUS shelf-stable prebiotics. More and more people buy fiber supplements to help keep themselves regular. Scientific evidence demonstrates that the addition of soluble fiber from certain foods to a diet that is low in saturated fat and cholesterol may help to reduce the risk of coronary heart disease*. Best of all, Life Force Intestinal Tone Psyllium Husk powder product contains no sugar or artificial sweeteners. There is no other psyllium product on the market that provides solid nutrition while maximizing relief in a 30-serving container. One serving of Intestinal Tone provides 6 total grams of fiber (5 grams soluble fiber, 1 gram insoluble fiber) of your daily nutritional needs. It is a blend of all-organic components found in nature. This, in turn, can allow overall absorption of nutrition to continue to keep you healthy and well*. Those suffering with celiac disease can get much needed extra nutrition while still providing comfortable bulk. Because it is in powder form, it is easily mixed with the needed full glass of liquid. Not for use by children under the age of six. This product is known as “Psyllium Husk” in Canada. Intestinal Tone is part of the 3-part Colon Cleanse Kit, which builds and strengthens your digestive health through cleansing*. 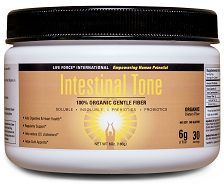 View the technical data sheet for Intestinal Tone, including medical references and ingredients. Can you please explain the quality of the psyllium used in Intestinal Tone/Psyllium Husk? The psyllium used in Intestinal Tone/Psyllium Husk is the highest grade available. Specifically, it is Pharmaceutical Grade, meeting the strict standards of the United States Pharmacopoeia (USP). To achieve USP, every lot of psyllium (80 percent seeds plus 20 percent husks) must achieve USP quality standards for elements such as purity (no foreign seeds, materials or substances) and safety. Since seeds can be easily contaminated, the USP grade guarantees the product to be free of microbiological hazards (e.g., pathogen bacteria such as E. coli, salmonella, listeria, etc.). Our product is 100-percent pure psyllium. Why should I buy from you instead of at a drug store brand of fiber supplement? Many people think that if their fiber supplement does the job, then just buy the cheapest there is. Unfortunately, they don’t realize the ramifications of putting the generic or popular brand of fiber supplement into their body. When you read the label, you see the difference: additives, artificial colors, sugar (yes, really! ), artificial sweeteners, and sub-par psyllium, which alone or together will alter the colon’s environment in less than desirable ways. All your system needs is a broom to push the waste away; these products end up being a metal-based push broom that leaves waste behind with additives as well. How do I take Intestinal Tone/Psyllium Husk? The labeling suggests you mix 1 rounded teaspoon in 8-16 ounces of water or your favorite liquid in the morning and evening. Stir briskly and consume immediately. We recommend a larger quantity of water (32 oz.) sipped over a longer time, both because of delivery and because of the very practical reason that if you get called away from your cup, you won’t be concerned about the texture when you come back. Further, any insoluble fiber product absorbs liquid through your intestines to work, and this provides enough liquid so your body isn’t risking dehydration. Will this work the same if I put it in capsules? Indeed it will. We still suggest drinking more water than just what is needed to swallow the capsules, though…at least 16 ounces. People who are new to fiber supplementation have been spared the gloppy, gunky, raw-tasting mess that used to be fiber supplements of yesterday. Even though Intestinal Tone has more fiber than any other major supplement on the market, it has an indiscernible taste and appearance and contains no sugar. Enjoy it in any juice, smoothie, or even 20+ ounces of water with lemon. And because it is in a powdered form, you don’t have to worry about gagging on large capsules or pills. Here’s to making the most of all of your nutrition!